A student of Bhubaneswar High School was awarded Certificate of Excellence in the national-level essay competition conducted by Tata Building India, New Delhi. The residential high school of Chennai Students’ Home secured platinum rating from Indian Green Building Council (IGBC) for its environment-friendly practices such as water conservation, achieving energy efficiency, waste management, maintaining the campus healthy and hygienic, etc. This is the first school in Tamil Nadu and the fourth in India to receive platinum rating (the highest rating) by IGBC. A class-10 student of the high school run by Chennai Students’ Home secured the third prize in the state-level science exhibition competition held jointly by the Department of Science & Technology, Government of India, and Tamil Nadu Science and Technology Centre. A professor of the Vivekananda College of Chennai Vidyapith secured Session’s Best Presentation award for his paper in the First Annual International Conference on Education organized by the International Institute of Knowledge Management at Beijing, China. A student of Chennai Vidyapith participated as chairperson of the Human Rights Council in the fourth edition of Model United Nations (MUN). MUN is a programme simulating the workings of different organs of the United Nations conducted by the King Juan Carlos University, Madrid, Spain. Coimbatore Mission centre’s College of Arts and Science was re-accredited with ‘A’ grade by NAAC. A student of Shivananda Higher Secondary School of Coimbatore Mission centre secured first rank in the state under the visually impaired students’ category in the higher secondary examination conducted by Tamil Nadu Board. 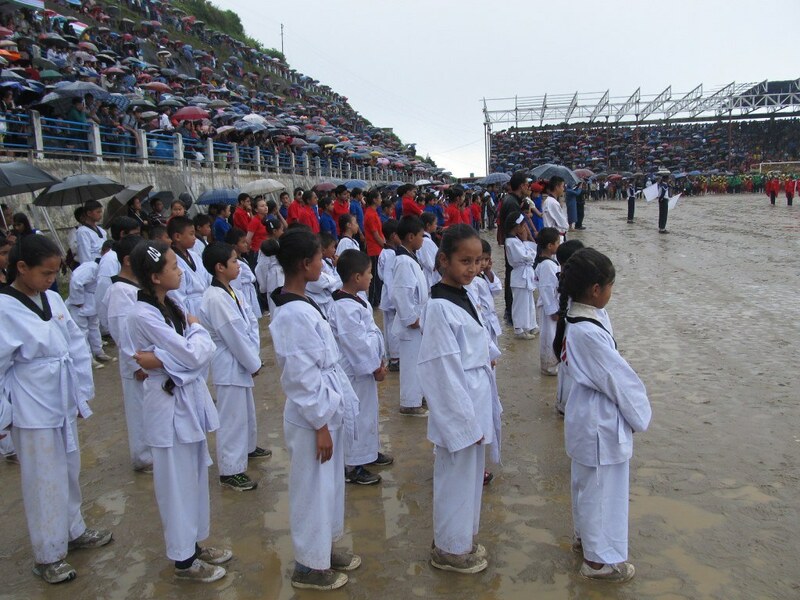 Students of the Gadadhar Abhyudaya Prakalpa unit run by Darjeeling centre won 2 gold medals, 2 silver medals and 11 bronze medals in different categories in the District Taekwondo (a Korean martial art) Championship held by Darjeeling Police. Delhi centre distributed 88 projectors to government schools in and around Bhopal and Delhi NCR. Students of Deoghar Vidyapith students secured 2 gold, 1 silver and 2 bronze state-level medals in Mathematics Olympiad, 1 silver state-level medal in Cyber Olympiad and 1 bronze international-level medal and 1 silver state-level medal in Science Olympiad organized by Science Olympiad Foundation. Two students were adjudged first runners-up at a quiz competition conducted by Reserve Bank of India at Ranchi. A girl student of class 7 of Jamshedpur centre’s English School at Bistupur secured 1st position in Bihar and Jharkhand circle and 2nd position at national level in an all-India painting competition on the topic Preservation of Environment organized by Axis Bank. The Government of West Bengal had decided to hand over the management of Ekalavya Model Residential School, a government-run school for tribal students at Jhargram, Dist. Paschim Medinipur, to Ramakrishna Mission. The General Secretary signed a Memorandum of Agreement in this regard with the Government in the presence of the Chief Minister of West Bengal, in a function held in Medinipur. A student of the Higher Secondary school of Kalady centre secured 2nd rank in the entrance examination for admission to Architectural Engineering conducted by Kerala government. University Grants Commission conferred the status of College with Potential for Excellence on Residential College (Narendrapur), Vivekananda Centenary College (Rahara), and Sikshanamandira (Saradapitha). Narendrapur centre installed a Braillo 600 SR printer in the Blind Boys’ Academy for speedy printing of Braille books. Seventy-one students of class 11 of Narendrapur school participated in the Junior Scholarship Test, 2015, a competition for school students conducted by Jagadish Bose National Science Talent Search, Kolkata. Out of them, 26 students were awarded junior scholarship and 11 received junior encouragement award. Besides, the school won the Best School Award. In the 15th National Paralympic Swimming Championship held at Belgavi, 6 students of Narendrapur centre’s Blind Boys’ Academy won 12 gold and 11 silver medals in different events. Besides, one student was awarded National Paralympic Champion Trophy for securing 4 gold medals in the sub-junior group. Ramharipur high school received Bankura District Best School Award, 2015, from the School Education Department, Government of West Bengal, considering its good infrastructure and management and the quality of education offered. Ranchi Morabadi centre’s Divyayan KVK got affiliation from Agriculture Sector Skill Council of India (ASCI) for 5 vocational training programmes and got affiliation from National Institute of Open School for 2 new courses. One of the nursing students of Thiruvananthapuram centre’s nursing school secured 86% marks in Nursing Council exams for GNM internship and was placed 2nd in the state level. Four students of Vivekananda Veda Vidyalaya, Belur Math, were awarded gold medals for securing all-India first ranks in Purva Madhyama (equivalent to Class 10) and Uttara Madhyama (equivalent to Class 12) examinations conducted by Rashtriya Sanskrit Sansthan, New Delhi, in 2013 and 2014.